He is a lone wolf. A man alone. No pack, no family, no one to call his own until one single, innocent letter awoke Elizabeth's wolf. 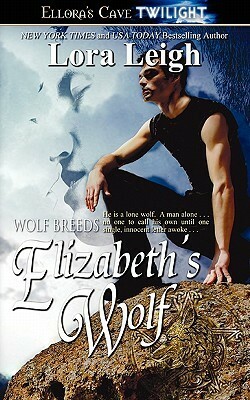 Elizabeth’s Wolf is one of my favorites in the Breeds series. It’s because it has a wounded soldier and a little girl. I feel in love with Dash the first moment he is featured and of course Cassie and her mother. I love how the story starts, love Cassie our little girl who has a little fairy that guides her to write to this soldier who has no family, no friends, no one to write too him. It brings home the sacrifices our men and women make even toughs who don’t have someone waiting back home for them. Dash is a wolf breed, one that’s genetics are recessed, so it makes it easy for him to hide in the world. Not all the breeds can hide, but many have found a way and a few are now coming out to the world. It’s the beginning of that coming out and the world is either accepting them or not. Deep down Dash’s wolf even though Dash himself doesn’t understand knows that he must find and protect this little girl and her mother. Elizabeth did what any mother who loves her child would do. She protected her little girl and knows that she is at an end and needs help, but doesn’t have hope anymore. She’s been burned one to many times and has watched good people die, so she doesn’t trust. These two where great together. Their are several surprises along the way and once they find out what Cassie is things start to fall into place. It’s an emotional upheaval for all. One of my favorite lines from Elizabeth’s Wolf is: “Let me show you have a Breed male makes a meal out of his mate.” Oh that’s dame hot! I’ve enjoyed several of the books in the Breeds series. Some where better then others. Some can be read as standalone while others follow a story plot from one book to the next. The Breeds themselves are an interesting species and they don’t fully understand their race yet, so the finding mates and living life is a journey. Is this the incredibly long series I’ve been scared to start? This book sounds amazing and its not too far into the series that I could get to it fairly quickly. Yes, this series is long. It’s now up to 31 books published with the newest release that came out this week being Wake A Sleeping Tiger. Some in the series, like this one, can stand on their own and be read out of order. I think this one reads so well is; because it’s the first of the Wolf Breeds. As for diving into this series; this one is a good one to start with or you can start at the beginning with Tempting the Beast. The only thing is the earlier releases where published through Ellora’s Cave, which is out of business and I haven’t seen or heard that the author is going to republish them, so finding them is hard. If you library has eCopies or the books then you are good to go, other wise it’s going to be a search to find the early published books. I’m lucky my library has them, so I can reread them when I’m feeling in the mood.